John 3:16-18 is arguably the most famous gospel passage. You see it written on placards at football games on TV. In a rare breakaway moment the evangelist addresses disciples to emphasize the importance of having faith in the Son of God. And don’t be one-sided about it either, John says. All truths of the faith must be accepted because they aid us in our search for God. In his first letter John writes, “Whoever does not believe in the Son of God who they can see cannot believe in God the Father who they cannot see.” Yet Jesus says, “Whoever has seen me has seen the Father” (Jn 14:9), and “the Father and I are one” (Jn 10:30). In John’s gospel Jesus promises to send his Spirit, “the Advocate” (Jn 14:26). What should we believe? The answer: all of the above. Today is Trinity Sunday. 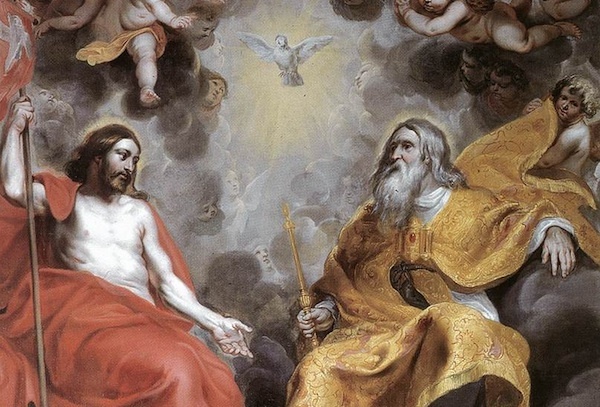 The Holy Trinity is one of the most difficult truths of the faith to understand, like the Incarnation and the Resurrection, and many other aspects of Catholicism. To understand and to believe in the Trinity is to accept that we worship one God—there is no other—who exists eternally in three divine persons: the Father, the Son, and the Holy Spirit. We pray this truth in the Gloria, and in the Nicene Creed, and when we make the sign of the Cross. This we call the law of prayer: we pray what we believe. This is what the Catholic Faith teaches: we worship one God in the Trinity and the Trinity in unity. We distinguish among the persons, but we do not divide the substances. They cannot be divided because there is one God in three Persons and God cannot be divided because he is the pure and eternal Spirit, a substance in and of himself that cannot be divided. This comes from Saint Athanasius, a fourth-century theologian and a bishop, a very learned man. We don’t have to be theologians to ponder this mystery. Occam’s Razor is a philosophical idea that says that the best solution to any challenge is usually the simplest. The simplest way to understand the Trinity is to make the Sign of the Cross. As Catholics, every prayer we offer to God begins with and ends with the Sign of the Cross, the simplest expression of the Trinity that we know. Why? Because God is love and the greatest expression of love is in the Cross — even a child understands that forgiving and giving are the highest expressions of love and on the Cross the Holy Trinity, by means of the Incarnate Second Person, forgave us and gave us eternal life. The theological term to describe unity of the Trinity is consubstantial—“of the same substance”—which we pray every Sunday in the Credo. Prayer and meditation on the Credo is another way to enhance our belief in and understanding of the Most Holy Trinity. The Credo must never become routine. God has also placed in Creation many analogies for us to ponder — these are like fingerprints of the Triune God. Although all physical analogies break down in some way, being inadequate to the spiritual reality of which they hint, they help us illustrate the doctrine. Saint Patrick was a bishop in Great Britain during the “Dark Ages”, a time when it seemed to Christians that the light of Christ was nearly snuffed out. Patrick used a shamrock as an illustration to teach new Catholics about the Trinity. A shamrock has a three leaves attached to one stem. Though you can distinguish the parts, they are still that one thing — the shamrock. Likewise, God is one God in three distinct divine persons: Father, Son, and Holy Spirit. Unlike the leaves of the shamrock, the three divine persons of the Trinity cannot be separated, but they can be distinguished by their relationship to one another. Let me give an example closer to home—water. Water is important to everyday life. Without water, nothing on earth could survive. Water is as vital as are sunlight and oxygen: another expression of the Trinity. In a farming community such as ours, the proper irrigation of crops is urgent to ensure a bountiful harvest each year. Water is the source of life without which nothing can survive. It is one substance (H20). It is also three distinct things. liquid water, a gas or vapor, and solid ice. Water is the “universal solvent,” so I was taught in high school science class, and planet Earth is comprised of 2/3 water. This is nature’s balance. Water falls from the sky as rain, it gathers in rivers, lakes, ponds, streams, and oceans, and its vapor rises to replenish the skies from which it came. The writer of the Book of Ecclesiastes says, “All rivers go to the sea, yet never does the sea become full. To the place where they go, the rivers keep on going” (1:7). The Holy Trinity created our universe and sustains it through an unbroken chain of life. God created water so that we could have life on earth and in heaven. “In the beginning, when God created the heavens and the earth, the earth was a formless wasteland, and mighty wind swept over the waters” (Gn 1:1-3). This is the first expression of the Trinity in the Bible—“In the beginning.” Of course we have to be careful with this analogy — we cannot melt Jesus into the Father, and then boil him into the Holy Spirit. Nevertheless, the amazing, life-sustaining qualities of water — one substance existing in three forms — is one of those fingerprints of the Trinity. Water is used in the Sacrament of Baptism because it is a symbol of the life of the world created by God as he dwelling place of his Son, who sent his Spirit that we might contemplate God’s love and enter the kingdom of heaven. Water falls from the sky and nourishes the earth. It freezes in the winter and when it melts in the spring the vapor returns to its source, the sky. Soon the flora will sprout and the fauna will emerge from hypernation. So it has been since creation. To God, heaven and earth are united. “He looked at everything he had created and saw that it was very good” (Gn 1:31). Is it any mistake that we live in a three-dimensional universe? Or that in the grammar of our ordinary speech we cannot escape using a first, second, and third person? Elementary. Easy as A,B,C; easy as 1, 2, 3. Next Article Vladimir the Inscrutable: Shall We Savage or Salute Putin? This is an incorrect way to say it. In fact, this is the heresy called modalism. The water in three forms analogy is also modalism. A cloud as in smoke, not vapor. See Exodus 13:21-22, pillar of fire by night, pillar of smoke by day. I see this article is still up here. I’m disappointed. The paragraphs which liken the Trinity to water, vapor, and ice are heresy. It is a heresy that goes by the names Sabellianism and Modalism. Catholic Lane should be ashamed to have published this, and the author should be ashamed to have written it.